Meanwhile, Mueller’s special counsel won’t investigate ample evidence pointing to a) Clinton collusion with the Russians (Clinton paid for a warrant to surveil a Trump campaign associate during the 2016 election), b) humongous Clinton foundation fraud, c) massive, FBI-coordinated destruction of evidence/obstruction of justice, d) gross negligence in handling classified information, and e) Clinton’s treason as Secretary of State. There is also no effort by Mueller’s special task force to investigate multiple signs of alleged abuses of government surveillance powers by the Obama Justice Department in obtaining warrants to unjustly monitor and unmask Carter Page and other Americans, enormous 4th amendment violations which are being swept under the rug. Yet Mueller, with a checkered history as FBI head during the anthrax threats, the IRS scandal, and much more, has not only complete Democratic backing, but wide Republican support. This is underscored by the fact that the GOP-controlled Senate is drafting a Mueller protection bill while Republicans warn Trump not to fire partisan hack Mueller, stating that it would be “political suicide!” Upshot: the Constitution-thwarting “DC swamp,” perhaps best captured by noting that apparently both former Bush presidents voted for Hillary over Trump — a kind of collusion by Marxist Democrats with crony Republicans — is rebelling against Trump and wants to put him down. In other words, the swamp wants to remain above the law, so we can’t return to the RULE OF LAW. The 4th Amendment: The right of the people to be secure in their persons, houses, papers, and effects, against unreasonable searches and seizures, shall not be violated. In other words, if the government improperly seizes private or privileged material, the violation has already occurred, even if the government never uses the material from the person from whom it was seized. The 5th Amendment: no defendant (in this case President Trump) shall be compelled in any criminal case to be a witness against himself. In other words, said cannot be used to incriminate the defendant which counsel represents or, by extension, that defendant’s counsel. The 6th Amendment: the defendant shall have the assistance of counsel for his defense. “Privileged material” will result, which prosecutors don’t get to see or use. When overlaid on to the 4th Amendment, it prohibits government officials from intruding on the privacy of lawyer/client confidentiality rights of citizens. In the interim, as predicted in my April 5th, 2018 video, EPA head Scott Pruitt’s biggest challenge won’t be the “Pravda press,” but the entrenched, constitution-mangling and property rights-eviscerating EPA bureaucracy. Will an increasingly maligned and compromised Trump be supportive, i.e., will Dr. Jekyll be at Pruitt’s side when it gets really ugly? Fortunately, Dr. Jekyll seems to be at work, as evidenced by Pruitt’s new second in command, a former coal industry lobbyist, Andrew Wheeler. Now, there is a lot of speculation (and excitement) in the alt media community about over 24,000 executive branch sealed indictments. 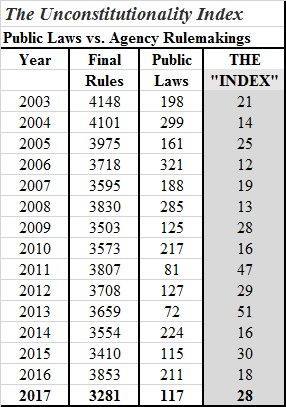 Specifically, when will they be unsealed and arrests made, so that the rule of law once again extends to the ruling class? Hope springs eternal that felonious indictments will be unsealed with increasing frequency as the 2018 election grows closer. 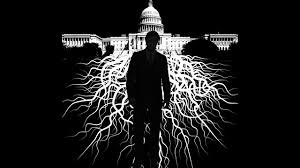 Moreover, that once “unleashed” — and assuming such a process couldn’t or wouldn’t be derailed — increasingly large swaths of the federal ruling elite in Washington DC and throughout the nation that have acted lawlessly will be implicated and charged with crimes. 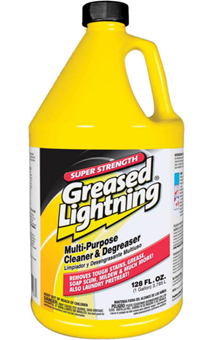 Such a “cleansing” would help purge the kleptocratic and bureaucratic lawlessness (unconstitutional legislation followed by property rights-eviscerating extortion by both elected officials and unelected bureaucrats) that is so intimidatingly widespread. It would also constrain despicable, amoral, and unconstitutional behavior by powerbrokers, which would be pivotal to any effort to return the US to a representative, constitutional republic while boding well for rescuing the west from an all-powerful, unrepresentative administrative state (the unelected bureaucracy). The upshot of all this: the president will likely consume a growing portion of his time fending off efforts to castrate his administration; call him a potentially “early lame duck.” It could also cause his cabinet to “freeze up” or drive away potentially gifted constitutional cabinet picks to replace his still all too “swampy” cabinet. Obviously, if the Democrats retake the House or the entire Congress, then Trump impeachment efforts will be “the order of the day,” which would could turn Trump from a “lame duck” into a “dead duck” in terms of executive branch/”CEO” functions. President Trump’s — and the Republicans’ — broad-based failure to deliver what they so fervently promised when they sought a governing mandate in 2016 may well cost them their congressional majority this year should the GOP base “stay home in disgust.” Specific broken promises include the following: a) true Obamacare relief (only non-payroll relief, not widespread relief) instead of Obamacare enshrinement, b) government spending brought under control in place of unprecedented profligate spending (the discretionary part of federal spending is to grow by 13%), c) lower federal government deficits (at a $1.2trn annual run rate, they are nearly doubling), d) defunding of misnamed “sanctuary cities” (their funding remains), e) widespread regulatory relief (collectively, executive branch administrative state agencies/bureaucracies got more funding! ), f) a border wall (not — only $1.6bn in funding out of over $1.3trn in projected discretionary spending! ), and g) no more amnesty for illegal aliens (Trump offered 1.8m illegal aliens amnesty, more than twice what the Democrats had sought!). The March 2018 household-survey count of employed Americans declined by 37,000 while the ranks of full-time American employees dropped by 311,000 (shadowstats.com). 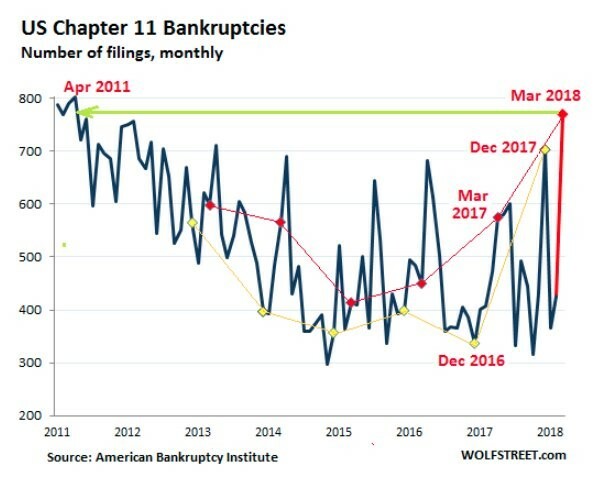 A 63% year-over-year surge in US filings for Chapter 11 bankruptcy protection was tabulated in March. The worst-ever quarterly US merchandise trade deficit threatens to deflate GDP growth (shadowstats.com). US crude inventories are down 7% year-over-year at a 10.9% annualized rate over the last 6 months. German exports fell a seasonally adjusted 3.2% month-over-month in February, the biggest monthly drop since August 2015 (http://www.macrostrategy.co.uk), raising question marks about the vitality of the EU’s economic dynamo amidst growing EU liquidity and solvency concerns related to the ECB’s asset purchases winding down. Declining global productivity: The failure of the technology is starting to be felt. Case in point: the rapid increase in DRAM prices over the last 18 months, which was due to the failure of technology laws (e.g., Moore’s Law), fed into a 10% increase in the ASP of smartphones worldwide last year, its fastest on-year growth yet (http://www.macrostrategy.co.uk). 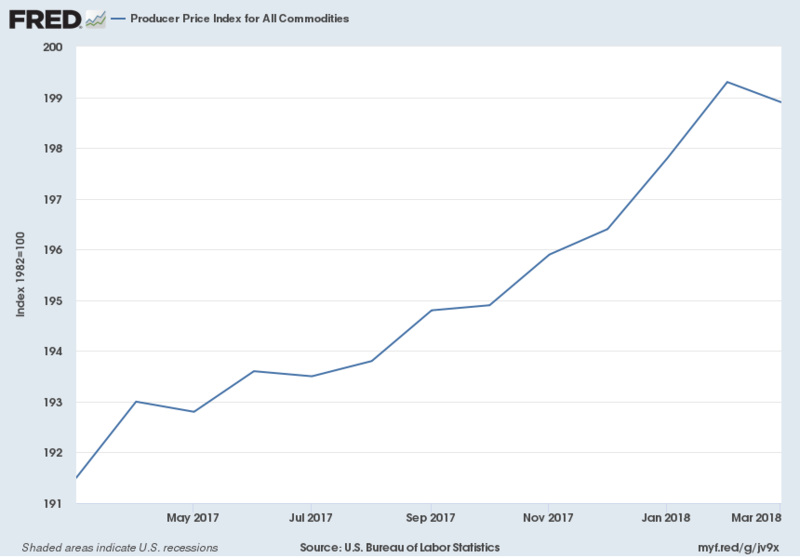 Domestic (US) inflationary pipeline pressures are building both in commodities (below) and in manufacturing. Needless to say, sustained dollar weakness would aggravate US inflationary pressures, potentially substantially. And all that “on-balance sheet” debt doesn’t address the unfunded, non-financeable “off-balance sheet” commitments that central governments have (the US has $210trn, according to one source), from social security to medical care commitments for a burgeoning retirement ranks courtesy of a) inadequate contributions and b) retiring baby boomers. Nor does it address tremendously unfunded defined benefit pension plans, both public and corporate, which exceed $6trn in the US alone. Share buybacks in 2018 have averaged $4.8bn per day, double the pace from the same period last year, and could reach more than $800bn this year, which would eclipse both $530bn in 2017 and even 2007’s all-time high of just under $700bn. Not surprisingly, a recent Bloomberg analysis found that about 60% of tax cut gains will go to shareholders, compared to 15% for employees. More financial engineering-based EPS growth, revisited. The $1.5 trillion GOP tax cut legislation (over 10 years) is a boon to corporations, should it remain law. It slashed the corporate tax rate to 21% from 35% and it reduced the rate on corporate income brought back to the United States from abroad to between 8% and 15.5% instead of 35%. As welcome as lower corporate tax rates are, capitalizing on them ultimately depends on achieving organic (top line) growth on the one hand and on avoiding a material increase in debt-servicing costs at both customer and corporate levels on the other hand. 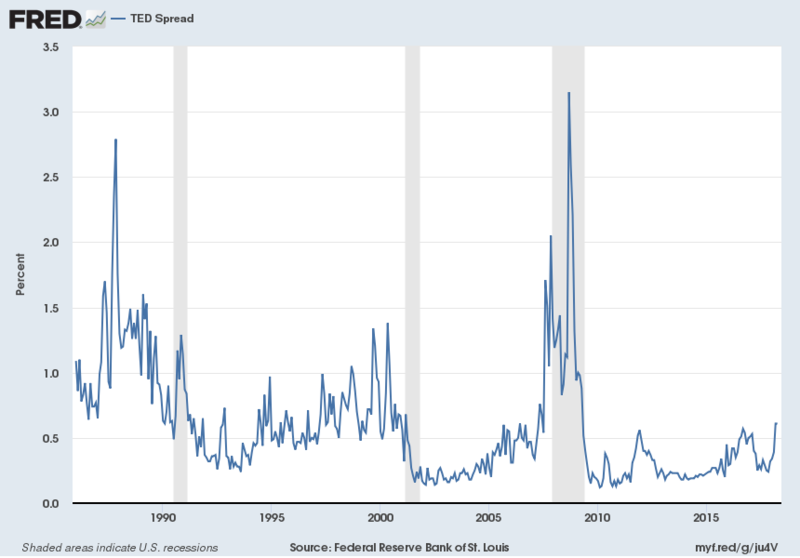 Given a perpetually more interest rate sensitive domestic and global economy, this isn’t an idle organic growth or financing cost concern, especially when considering the pronounced P&L operating leverage (fixed cost structure) inherent in many businesses. Stated differently, top line weakness typically leads to outsized profit compression. Poor earnings/EPS quality (also from a heightened foreign currency exposure perspective thanks to decades of “outsourcing” production)! 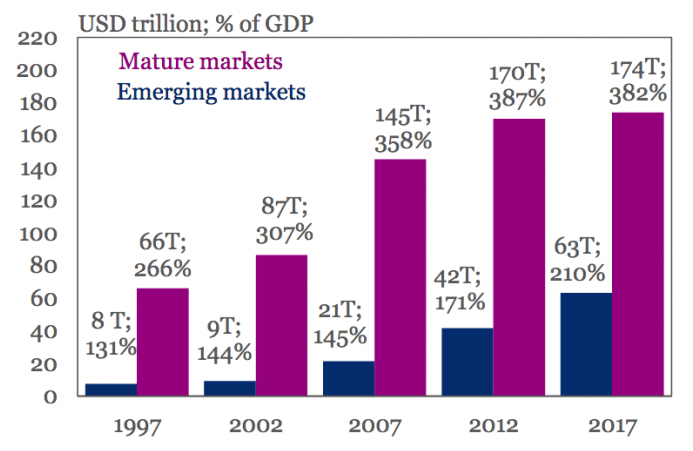 US corporate debt is up from $3.5trn to over $6.1trn in less than a decade. And the “million dollar plus signing bonuses,” multi-million annual compensation, job-hopping, 1,000x line workers’ compensation, “slash and burn” C-Suite crowd keeps repurchasing high P/E shares with cheap debt (thank you, global financial repression) and with cash flow to underpin their multi-million dollar option gifts. Their prolific option grants a) typically vest way too early for top management to have a strategic focus and b) don’t incorporate rising book values per share thanks to retained earnings (non-distributed earnings); call it your proverbial non-aligned interests double whammy for strategic shareholders! Thus, instead of focusing on driving sustainable organic growth (we may delve into this topic in more detail in a separate post) and broad-based, lasting value creation, top management, richly compensated prior to “lifting a finger” and typically lacking strategic parallel interests with other shareholders and stakeholders, is motivated by corporate anorexia: reduce costs, R&D, and cap ex (slide 15), even if cuts into the enterprise bone. The associated EPS myopia will, if past is prologue, be partly “addressed” by issuing stock at much lower (than buyback) prices to reduce “balance sheet leverage.” The resulting dilution and the value destruction for the benefit of the “1% today” will be paid by non-privileged shareholders “tomorrow.” How so? Via lower future earnings power (and the associated lower macroeconomic growth) and via lower future P/Es, the progeny of underinvestment, debt-based EPS levitation, and the coming beyond the mean reversion of interest rates that a decade of unparalleled global financial repression has delayed. Rising political risks (and we haven’t delved into growing geopolitical risks, neither the typically tragic and immensely expensive war or trade war varieties, both of which can be highly susceptible to “domestic disenchantment”), rising economic risks, rising financial risks, and rising peak EPS risks all suggest investors ought to “trim exposure” to overvalued stocks and bonds. Moreover, given our accumulating toxic public policy stew fallout (i.e., unsound money enabling unprecedented deficits, redistributionism, cronyism, misallocations, and declining property right protections and the ensuing unparalleled debt and failing productivity), we envision that the Keynesian power brokers in charge of global central bank monetary policy will “double-down” on what has gotten us into so much political, economic, and financial trouble. The latter is all the more true given our rapidly rising dense energy availability, affordability, and EROEI (energy return on energy invested) challenges, and thus, to a large extent, our productivity challenges. We thus continue to think that QT (central banks selling bonds) will be brief, if it truly gets off the ground at all. However, when it becomes obvious to our central planners that “their” asset bubble progeny, upon which they have based their currency and economic malpractice “success,” are quickly deflating, they will rush to defend them. How? By expanding their balance sheets; by buying sinking bonds. While we don’t know when this will occur, we are convinced that it will. 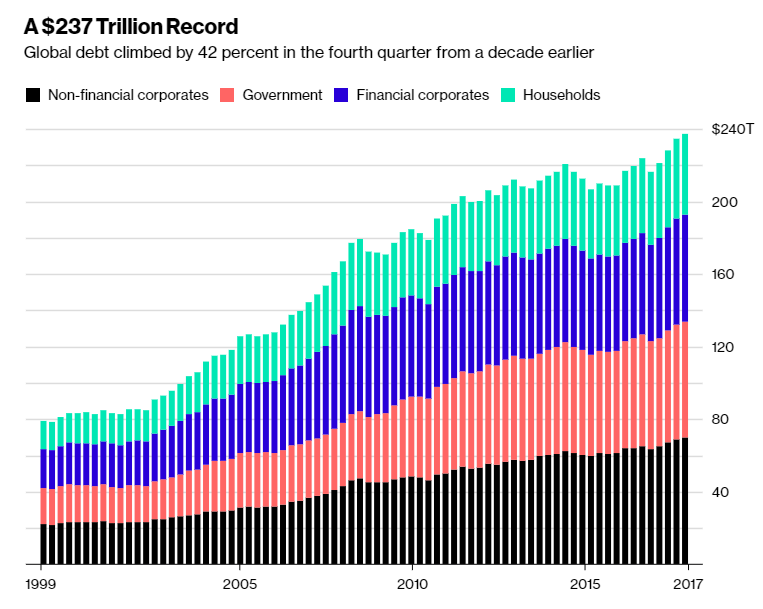 At such a juncture, it will be impossible to deny just how terribly flawed our “Frankenstein” central bank monetary policy has been, especially when dwelling on US debt of $68trn and global debt of $237trn. So, if the bond vigilantes don’t “bolt” to front-run what will likely prove to be a very fleeting QT round by global central banks (again, if it commences at all), thereby driving up dollar-based interest rates in a world in which domestic and trade-related US financing needs could trump (no pun intended) $1.8trn on an annualized basis, surely rising inflation aggravated by “QE redux” will finally unnerve creditors. Why? Because they will be looking at entrenched and likely unprecedented currency debasement instead of a “financial repression worked” scenario. In such a world, even if outright defaults by various parties unable to meet obligations, from municipalities to states to massively underfunded public and private pension funds to “too big to fail enterprises,” can be addressed through the printing press, the value of the currencies in which they’ll be expressed will ultimately rival the value of a sheet of toilet paper. Thus, an upcoming global fiat currency debasement default will finally take center stage. This will drive up rates, punish bonds, and deliver hyperinflation. Sadly, it’s the only politically feasible path. And the opportunity to sidestep this upcoming implosion in both bond and stock valuations (they are tied at the hip) is staring us right in the face. Sage investors stand to benefit handsomely from the upcoming reversion beyond the mean. And they might be well served to recall that mining-based precious metals (PM) supply is expanding the above ground gold and silver inventory at a puny $138bn and $15bn annual rate, respectively, based on current PM spot prices. The resulting 1% – 2% expansion in above ground PM speaks volumes about PM’s scarcity. It also suggests that any material increase in PM holdings beyond the current 1%-ish stake of investable global portfolio assets, which are on target to reach $278trn, would have to be realized via massively higher PM prices, i.e., the demand curve shifting up stoutly. PLEASE NOTE: This commentary is not intended as investment advice or as an investment recommendation. Past performance is not a guarantee of future results. Price and yield are subject to daily change and as of the specified date. Information provided is solely the opinion of the author at the time of writing. Nothing in the commentary should be construed as a solicitation to buy or sell securities. Information provided has been prepared from sources deemed to be reliable but is not a complete summary or statement of all available data necessary for making an investment decision. Liquid securities can fall in value.